Inside mounted shutters mount to the inside of the window casing, and depending on your frame selection, could cover the window molding. Outside mounted shutters are mounted on the wall or existing molding surrounding the window. To determine that your window is deep enough for your shutters to be inside mounted, simply measure the depth from the glass to the outer edge of the trim or window casing. Be sure to clear all obstructions that may impede the louvers from operating properly. If your depth is 2 1/4" or more, inside mount is recommended; if less, outside mount will be required. A minimum recess depth of 2 1/4" is required for a 2 1/2" louver. A minimum recess depth of 2 3/4" is required for a 3" louver. A minimum recess depth of 2 7/8" is required for a 3 1/2" louver. A minimum recess depth of 3 1/4" is required for a 4" louver. A minimum recess depth of 3 1/2" is required for a 4 1/2" louver. 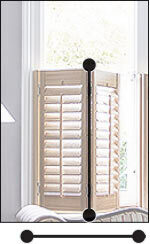 Café style plantation shutters have a frame that is drilled into the recess of the window opening. The panels will then fit inside the frame. This application only covers the lower half of the window opening, leaving the top of the window uncovered. 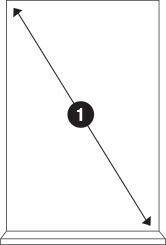 Measure the window opening from the top left corner to the bottom right corner and record it on a piece of paper. 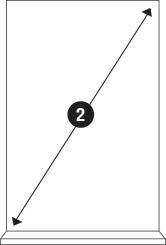 Measure the distance from the opposite corners (top right to bottom left) and compare it to the first set of measurements that you took. Determine the depth of your window using the Depth Requirements above. Measure the width and height of the window opening at the points where the shutters will be mounted. You will measure down to the nearest 1 /8” so please be sure to measure the window in 2 places for the width (top, and center) and write down both measurements. You will follow the same instructions for the height but measure only to the halfway point of the window as this application will cover only the lower portion. You may come up with 2 different measurements when measuring the two places for the width and height. In this case, you will want to use the smallest of the measurements for both the width and the height. If you are getting a 1/16” or 1/32” increment round down to the nearest 1/8”, and this is the measurement that you will provide. Example: 11/16” will round down to 5/8”. Tip: If your window has a sill, measure the height from the window sill to the halfway point of your window. Our factory will make all necessary deductions to the exact window measurements you provide us to ensure your product will fit and operate perfectly in your window. Do not make your own deductions. Do not add to the width to make up for any deductions. Since outside mount covers the entire window opening and frame, there are additions you will need add to make your order the correct size. Casing Frame: + 5 1/2"
Clearance: Ensure there is proper flat surface clearance on all 4 sides of the opening to accommodate for the frame. If you have a protruding window sill at the bottom, add half of the required additions for the height.